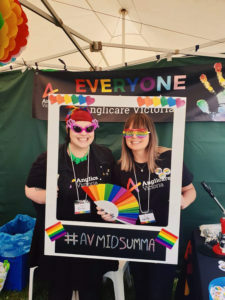 On January 20th Anglicare Victoria participated in Midsumma Carnival for the first time. The event kicks off Midsumma Festival, Victoria’s premier LGBTIQ cultural festival which champions LGBTIQ cultures and is a chance to celebrate diversity. Anglicare Victoria joined another 140 organisations at the event and. it was estimated that over 100,000 people joined in with the celebrations. Anglicare Victoria had a stall where employees, who had volunteered to participate, shared our message of diversity and inclusion. The organisation’s theme for the event was “Everyone is welcome at Anglicare Victoria”. The volunteers spoke with carnival revellers, telling them about the services and support we can offer to everyone. Marie-Claire Blin, part of the Anglicare Victoria team working towards Rainbow Tick Accreditation, highlighted that our presence was a really important step in promoting that our organisation is welcoming of people from LGBTIQ communities. Planning for next year’s event has already commenced- come along and join in the celebrations. Please contact for AVPRIDE@anglicarevic.org.au should you have any questions about this event or Rainbow Tick accreditation.